Eugene Cernan, the last man to walk on the moon, died Monday, Jan. 16, surrounded by his family. 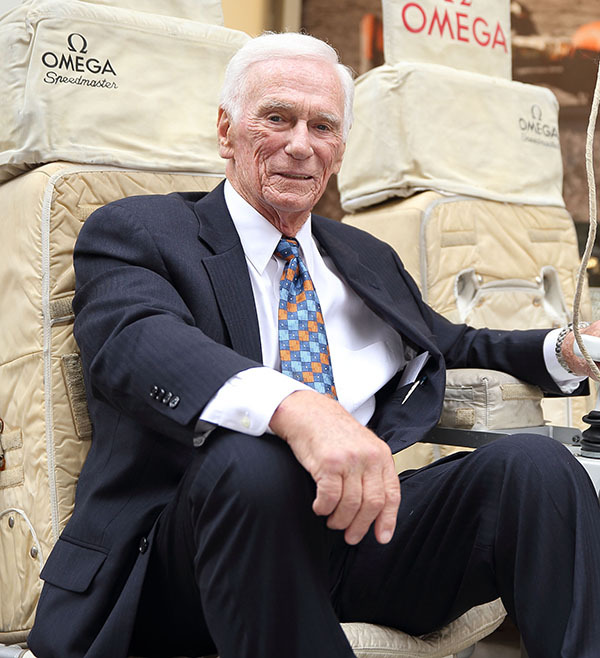 Cernan, a Captain in the U.S. Navy, left his mark on the history of exploration by flying three times in space, twice to the moon. He also holds the distinction of being the second American to walk in space and the last human to leave his footprints on the lunar surface. NASA Administrator Charles Bolden said in a statement after Cernan's death, "Truly, America has lost a patriot and pioneer who helped shape our country's bold ambitions to do things that humankind had never before achieved." A statement from Cernan's family said in part, "Even at the age of 82, Gene was passionate about sharing his desire to see the continued human exploration of space and encouraged our nation's leaders and young people to not let him remain the last man to walk on the Moon,"
Cernan was one of 14 astronauts selected by NASA in October 1963. He piloted the Gemini 9 mission with Commander Thomas P. Stafford on a three-day flight in June 1966. Cernan logged more than two hours outside the orbiting capsule. In May 1969, he was the lunar module pilot of Apollo 10, the first comprehensive lunar-orbital qualification and verification test of the lunar lander. The mission confirmed the performance, stability, and reliability of the Apollo command, service and lunar modules. The mission included a descent to within eight nautical miles of the moon's surface. 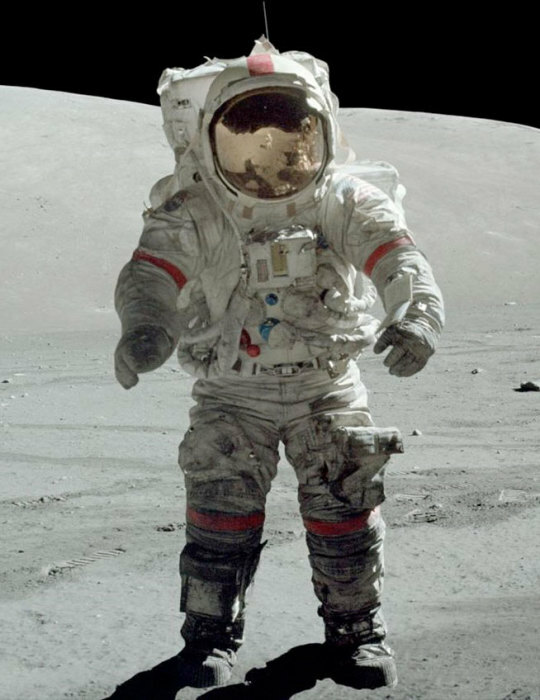 In a 2007 interview for NASA's oral histories, Cernan said, "I keep telling Neil Armstrong that we painted that white line in the sky all the way to the Moon down to 47,000 feet so he wouldn't get lost, and all he had to do was land. Made it sort of easy for him." Cernan concluded his historic space exploration career as commander of the last human mission to the moon in December 1972. En route to the moon, the crew captured an iconic photo of the home planet, with an entire hemisphere fully illuminated -- a "whole Earth" view showing Africa, the Arabian peninsula and the south polar ice cap. The hugely popular photo was referred to by some as the "Blue Marble," a title in use for an ongoing series of NASA Earth imagery. Apollo 17 established several new records for human space flight, including the longest lunar landing flight (301 hours, 51 minutes); longest lunar surface extravehicular activities (22 hours, 6 minutes); largest lunar sample return (nearly 249 pounds); and longest time in lunar orbit (147 hours, 48 minutes). Cernan and crewmate Harrison H. (Jack) Schmitt completed three highly successful excursions to the nearby craters and the Taurus-Littrow mountains, making the moon their home for more than three days. As he left the lunar surface, Cernan said, "America's challenge of today has forged man's destiny of tomorrow. As we leave the moon and Taurus-Littrow, we leave as we came, and, God willing, we shall return, with peace and hope for all mankind." "Apollo 17 built upon all of the other missions scientifically," said Cernan in 2008, recalling the mission as the agency celebrated its 50th Anniversary. "We had a lunar rover, we were able to cover more ground than most of the other missions. We stayed there a little bit longer. We went to a more challenging unique area in the mountains, to learn something about the history and the origin of the moon itself." On their way to the moon, the Apollo 17 crew took one of the most iconic photographs in space-program history, the full view of the Earth dubbed "The Blue Marble." Despite its fame, the photograph hasn't really been appreciated, Cernan said in 2007. "What is the real meaning of seeing this picture? I've always said, I've said for a long time, I still believe it, it's going to be -- well it's almost fifty now, but fifty or a hundred years in the history of mankind before we look back and really understand the meaning of Apollo. Really understand what humankind had done when we left, when we truly left this planet, we're able to call another body in this universe our home. We did it way too early considering what we're doing now in space. It's almost as if JFK reached out into the twenty-first century where we are today, grabbed hold of a decade of time, slipped it neatly into the (nineteen) sixties and seventies (and) called it Apollo." On July 1, 1976, Cernan retired from the Navy after 20 years and ended his NASA career. He went into private business and served as television commentator for early flights of the space shuttle. 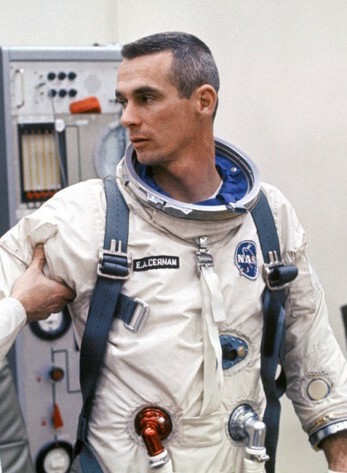 Cernan was born in Chicago on March 14, 1934. He graduated from Proviso Township High School in Maywood, Ill., and received a bachelor of science degree in electrical engineering from Purdue University in 1956. He earned a master of science degree in aeronautical engineering from the U.S. Naval Postgraduate School in Monterey, Calif.
Cernan is survived by his wife, Jan Nanna Cernan, his daughter and son-in-law, Tracy Cernan Woolie and Marion Woolie, step-daughters Kelly Nanna Taff and husband, Michael, and Danielle Nanna Ellis and nine grandchildren.